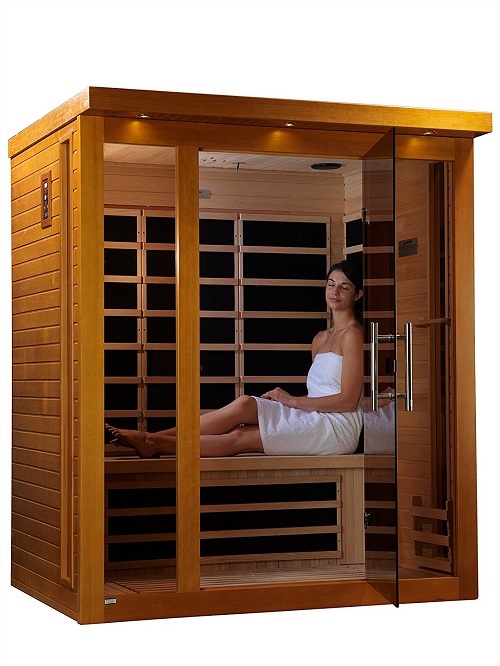 The Florence infrared 3 person sauna from Dynamic Saunas is a popular mid to high range FAR infrared sauna. The Dynamic brand are responsible for some of the best and most well received FAR infrared models on the market. 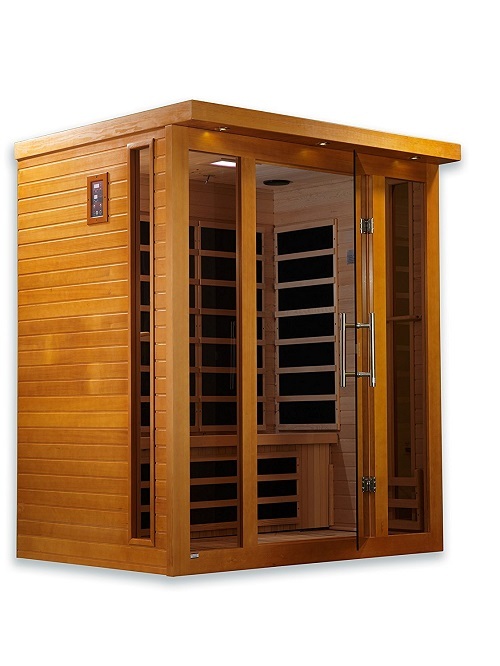 This 3 person sauna is an excellent choice for those looking for a multi featured, high quality 3 seater, and this model will largely appeal to those looking for a great infrared sauna at a reasonable price. 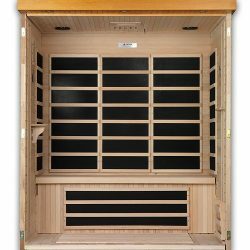 In this review we hope to give you all the information required to work out if this is the right choice in your hunt for the ideal FAR infrared sauna. Are There Any Problems With The Florence Model? Using green friendly Canadian Hemlock wood, this sauna is constructed using a thickness of 1.13 (2.87 cm) inches for the wood plank inner frames, compared to the regular under .9 inches (2.28 cm) which is often used with other manufacturers. This translates to an excellent ability of this sauna to retain heat efficiently. This means not only does your sauna reach the temperature you desire faster, and hold it better, but it's also easier on your bank balance over time as you'll be spending less on your electricity bills to get the most out of the Florence. The simple to use, and easy to read display on the Dynamic's Florence sauna makes it a breeze to select your desired settings, and quickly get your sauna session ready to go. The Carbon Energy Efficient heating panel heaters that are used by the Florence boast to be 30% larger than similar heating panels used in other saunas, which are quite often heated with ceramic tubes. The heating panels on the Florence are able penetrate the skin up to 40% more, and this helps the sauna to maximise its therapeutic benefits. Unlike with ceramic heaters, you also get the added benefit of never having to replace the Carbon Energy Efficient heating panels on the Florence. These heating panels are also able to heat up 30% faster than other saunas which are equipped with ceramic panels, not to mention nearly 100% faster than traditional rock and water steam type saunas. Also, not only that, but instead of the methods that traditional rock and water saunas (that often heat to 200 plus degrees and do not penetrate your skin), the Florence and the other models from Dynamic are able to work at a much safer and much safer 130 degrees Fahrenheit (54 degrees Celsius). Those wanting to be able to chill out and listen to their music during their relaxing sauna experience will love that the Florence has it's own built in speaker system. You are able to input your own music source via a 3.55 mm headphone jack, no matter whether it be a CD player, FM radio, or MP3 device, simply get the headphone jack output and input it into the Florence's system, and you're good to go! The exterior accent lighting simply adds to the aesthetic value of your sauna, and makes it look great positioned in your basement, spare room, or massage studio. This will especially appeal to those running a business who are wanting to project an image of professionalism and quality for their business. Like the Madrid from Dynamic, the Florence also has integrated “colour therapy” lighting, also known as “Chromo Therapy”. 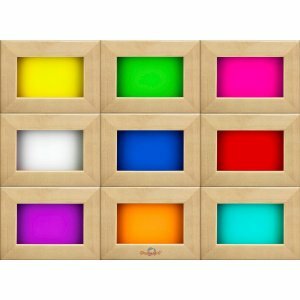 The idea behind this is that different colours have different physical healing benefits. Whilst there's not a lot of docuemented science behind this, we can all instinctually relate to the fact that various colour lighting has an effect on our mood and psyche. Dynamic have designed their sauna range with simplicity of setup and installation in mind, and as they say, assembly is literally a “snap” due to their clasp together assembly technology. It should be noted that while it should be very easy to actually assemble (and user reviews have verified this so far), you may want to have an extra 1-2 people handy when your sauna is delivered, as some of the actual pieces are very heavy, and you'll likely need help to get them in place. At the time of writing, there's not a lot of feedback available for this particular model, and so our ability to discern overall customer feedback is invariably pretty limited. Having said that, here's what's available. So far, there is only 1 review for this product on Amazon.com. It's a short review from a verified purchaser (which means it's actually someone who has been confirmed as buying the product, and not a fake review). The reviewer has left a 5/5 star rating for this particular sauna. The reviewer states that they “highly recommend” this particular sauna from Dynamic, that it was easy to assemble and that they're generally very pleased with it. The only additional piece of information added was that they think it would be wise to have a “couple” of people to help with the initial setup, as some of the parts are very heavy. From what's available at this point, we can't see any obvious problems with this model sauna. The only thing that might be a problem is if you're not particularly physically strong you may need some help getting the different components in place and setting them up initially, so it's recommended to have at least 1 if not 2 other people with you upon delivery to help you setup the sauna unit. When buying these kinds of large products online, as with most things you have several options. The main things that you want to take into account will be a) buyer and purchase security, and b) customer service. 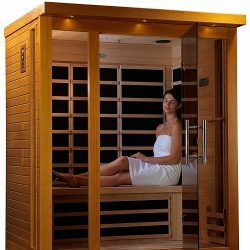 For this reason, we think that probably the best option for buying this or any other FAR infrared sauna online, is through the huge Amazon network. They have a very solid reputation, years of service trust, and excellent customer service. Not to mention the fact that your buyer safety when buying online on Amazon.com or there other sites is pretty much as good as it's going to get, with them being pretty much the biggest eCommerce site in the world. 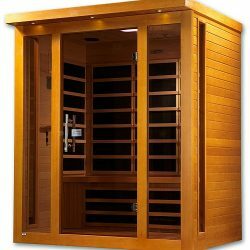 Click on the below link to see the current price on Amazon.com for the Florence FAR infrared sauna. There's currently no video footage of this model available. We'll add it to this page as it becomes available. Here's some of the common questions that people who were looking to buy the Dynamic Florence had before purchase. 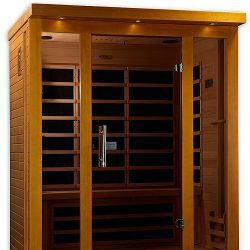 Will this sauna work on a 15 amp outlet? No, unfortunately like with most 3 person or larger saunas, you will require a 120V/20 Amp. The best thing is to get the advice and assistance from a professional electrician in this area to make sure you have everything setup properly and safely. What are the exterior dimensions of this sauna? As listed on the manufacturers website, on the product page for the Florence model here, the exterior dimensions are: 58 x 41 x 71 inches (147 x 104 x 180 cm) – this is shown in Width x Depth x Height. What are the interior dimensions of this model sauna? As above, you can find it listed here on the official site. The interior dimensions are: 58 x 41 x 71 inches (147 x 104 x 180 cm) – Again shown in Width x Depth x Height. Where are Dynamic Saunas products made? Can I setup the sauna outside? Theoretically it should be fine, as long as there's no direct exposure to the elements. However, if you're in a very cold location, it might take some time for the unit to heat up, as the level of insulation is not really designed with this in mind. In this situation it's always a good idea to check with the manufacturer first before you make your decision to purchase or not. You will need to contact the company Golden Designs, Inc. Their phone number is (909) 212-5555. Will this greatly increase my electricity costs? 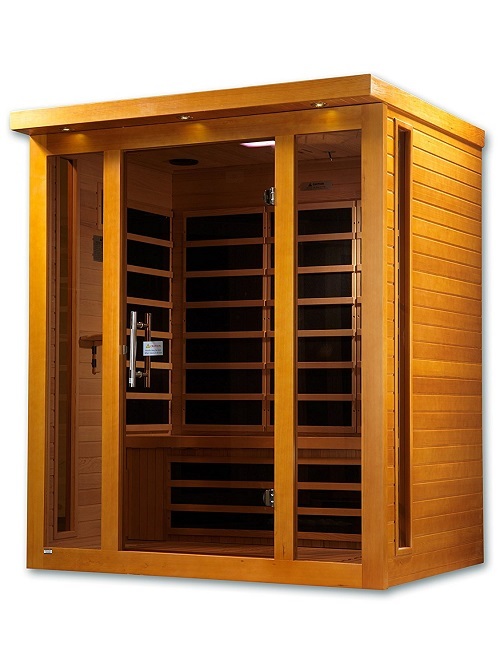 Based on the feedback of several users, after extensive use, there's no great change in the cost of electricity even if using this sauna unit regularly. Conclusion – Is The Dynamic Florence Sauna Worth Buying? 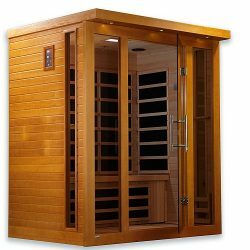 This sauna is an excellent choice for those who want a fully featured, spacious sauna unit with enough space to either very comfortably fit 1-2 people, or to fit in 3 people if you want to entertain guests or have family or friends get in and experience the magical benefits of FAR infrared with you. 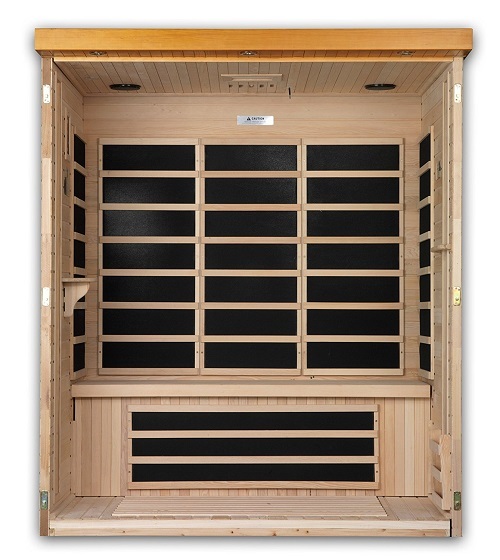 The efficient and environmentally friendly design and construction, and very low EMF rating will please those conscientious individuals, and the smart features like chromotherapy (coloured light therapy) and the built in speaker system will appeal to those looking for an effective, and luxuriously featured sauna model. 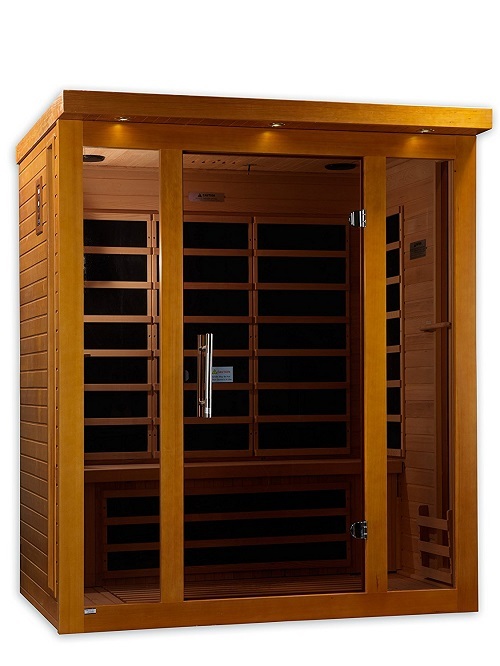 Overall we think this is an excellent choice for those looking for a great mid-top range FAR infrared sauna. Click on the below link to find out the current price listing on Amazon.com for this model.